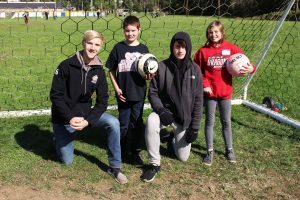 Monarch Boys’ Soccer players Wesley Eskridge and Cooper Curto helped Glen Dale Elementary students Nickoles Gilbert and Ayla Bushovisky during the Special Olympics Fall Field Day. Pictured from left are Wesley Eskridge, Nickoles Gilbert, Cooper Curto and Ayla Bushovisky. Marshall County Special Olympians gathered at John Marshall High School Thursday to compete at the first-ever Fall Field Day. The friendly competition included basketball and soccer games for all ages. This inaugural sporting event gave the Special Olympics athletes the chance to showcase their skills by participating in fun contests. Special Olympians from all Marshall County schools along with a few graduates hit the hardwood and competed in dribbling, shooting and passing events. Athletes were also on the soccer field participating in skills competitions and kicking goals. About 175 peer tutors from Cameron High School and John Marshall High School assisted the more than 130 athletes during the event. Marshall County Friends of Special Athletes gave each participant a t-shirt while the Knights of Columbus and the Knights of Pythias provided lunch for everyone at the Fall Field Day. Athletes will participate again in the spring at the Marshall County Special Olympics Track and Field event on Thursday, April 25, 2019 at the John Marshall High School Soccer Field in Glen Dale.